Belly Dance I: Thursdays 7:30 - 8:30 pm, Studio 1381, 1831 Brandywine St, Philadelphia PA. This class explores the fundamental movements of belly dance including basic dance posture, shoulder and hip shimmies, hip circles, hip drops and lifts, and figure-eights. Wear comfortable clothing and slippers or bare feet. $14 a class, Walk-Ins welcome. "Know Your Bellydance Audience." The Gilded Serpent, 24 November 2011. Click the link to get to the main Costumes page to see all the tutorials. Learn how to alter, fix, design and make your own costumes! 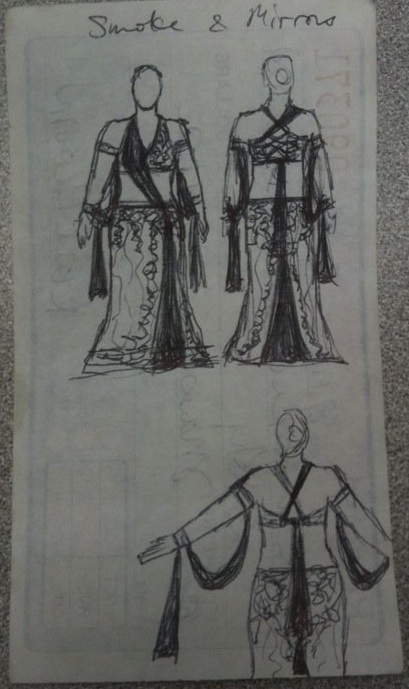 As a gift to my fellow bellydancers, I've published a series of online tutorials, explaining the methods and materials used to make professional quality bellydance costumes. Each tutorial is fully illustrated, and some even include video instruction. There are also links to other costuming resources, a page full of common questions and answers, and descriptions of the tools and materials you'll need. This resource is completely FREE! Share it with your friends and students!